UK operator group Vodafone announced a net loss of €7.8 billion for the six months to the end of September, thanks largely to some one-off impairments. Group revenue was down 5.5% year-on-year, but the company wrote down €3.5 bil on the disposal of Vodafone India and a similar amount for various impairments that also included India as well as Spain and Romania. There was also the time-honoured adjustments for currency and various other bits of accounting arcana that presumably make sense to someone. Here’s the P&L, which registers a slightly higher loss, but what’s a hundred mil between friends? “Our performance in the majority of our markets has been good during the first half of the year, and we have taken decisive commercial and operational actions to respond to challenging competitive conditions in Italy and Spain,” said Vodafone Group Chief Exec Nick Read. “Looking ahead, my new strategic priorities focus on driving greater consistency of commercial execution, accelerating digital transformation, radically simplifying our operating model and generating better returns from our infrastructure assets. Our goal is to deepen customer engagement through a broader offering of products and services and to deliver the best digital customer experience, supported by consistent investment in our leading Gigabit networks. The comment about towers seems to imply Read is thinking of selling and leasing back some towers, or something like that. 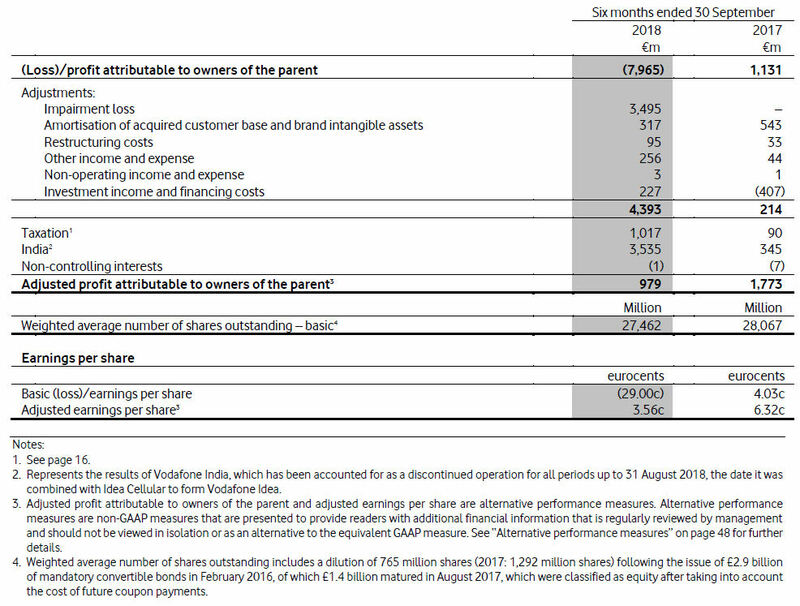 The upshot seems to be that Vodafone is fine for cash (the write-downs were mainly the devaluation of existing assets, so there’s no expenditure involved) and so it’s fine to maintain the current dividend level. This resulted in Vodafone’s share price ending the day around 8% up, so no worries. You can read further analysis of Vodafone’s numbers here.